Well, here it is way into the month, yeah, about half way into this month and I'm finally posting what can be planted. Geesh...maybe my New Year's resolution should be to get this stuff posted on time! 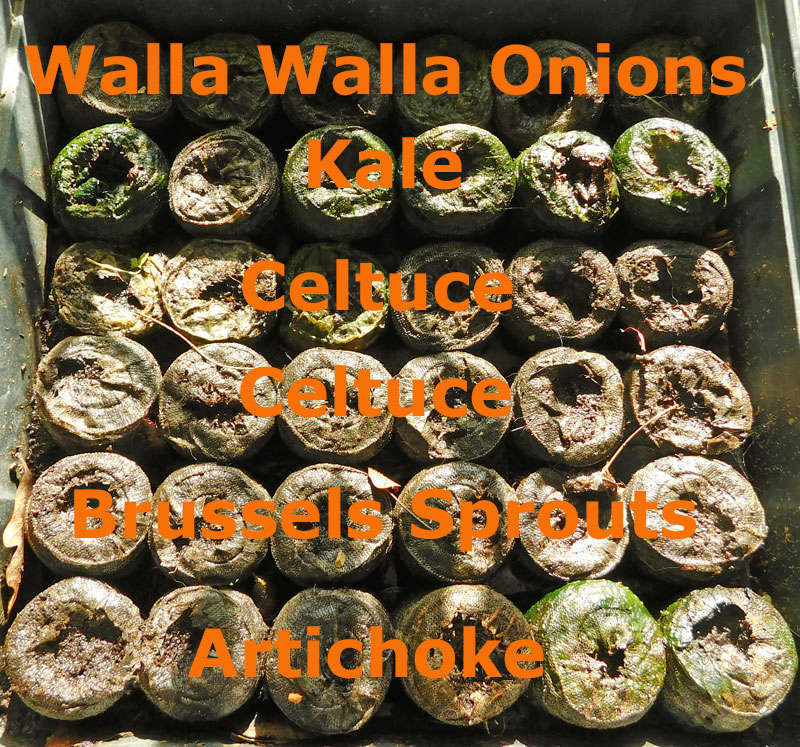 Here's what you could have been planting in December! Beetroot (also Beets) Sow in garden. Sow in garden. Harvest from May. Cardoon Grow in seed trays, and plant out in 4-6 weeks. Harvest from October. Celeriac Grow in seed trays, and plant out in 4-6 weeks. Harvest from May. Celery Grow in seed trays, and plant out in 4-6 weeks. Harvest from June. Chicory (also Witloof, Belgian endive) Sow in garden. Harvest from June. Corn Salad (also Lamb's lettuce or Mache) Sow in garden. Harvest from March. Plant tubers about 5cm (1.5") deep..
Kale(also Borecole)Grow in seed trays, plant in 4-6 weeks. Harvest from April. Sow in garden. Harvest from March. Grow in seed trays, and plant out in 4-6 weeks. Onion Grow in seed trays, and plant out in 4-6 weeks. Harvest from August. Pak Choy Sow in garden. Plant small bulblets, with stem just showing above ground. Harvest from May. Spinach (also English spinach) Sow in garden. (also Scallions, Bunching onions) Sow in garden. Swedes (also Rutabagas) Sow in garden. We've had a couple of frosty nights/mornings this past week in the Modesto area, but nothing that would be considered a hard freeze in in the next few weeks. We'll be getting more rain and of course our famous tule fog... and the plants love it! So do the snails!! @PNG_Grandma wrote: Well, here it is way into the month, yeah, about half way into this month and I'm finally posting what can be planted. Geesh...maybe my New Year's resolution should be to get this stuff posted on time! Here's what you can plant could have been planting in December! We've We're in for had a couple of frosty freezy nights/mornings this past coming week in the Modesto Fresno area, but nothing that would be considered a hard freeze in in the next few weeks. We'll be getting more Maybe a little rain and of course our famous tule fog... and the plants love it! So do the snails!! I'm bumping this older thread by PNG_Grandma. With our many micro-climates, you can check Gardenate for your Zone for adjustments to this planting schedule. At least this year I know what a Rutabaga/Swede is! Angelica Plant in garden. Harvest from 18 months. Beetroot / Beets Plant in garden. Harvest from April. Cape Gooseberry/Golden Berry Start undercover in seed trays, plant out in 4-6 weeks. Harvest from May. Cardoon Plant in garden. Harvest from October. Carrot Plant in garden. Harvest from May. Celeriac Start undercover in seed trays and plant out in 4-6 weeks. Harvest from May. Celery Start undercover in seed trays and plant out in 4-6 weeks. Harvest from June. Chicory/ Witloof/ Belgian endive Plant in garden. Harvest from June. Corn Salad/ Lamb's lettuce/ Mache Plant in garden. Harvest from March. Jerusalem Artichokes/ Sunchoke Plant in garden. Harvest from June. Kohlrabi Plant in garden. Harvest from April. Mizuna/ Japanese Greens/ Mibuna) Plant in garden. Harvest from March. NZ Spinach/ Warrigal greens Plant in garden. Harvest from April. Pak Choy/ Bok choy) Plant in garden. Harvest from April. Radish Plant in garden. Harvest from March. Rutabaga/ Swedes Plant in garden. Harvest from April. Shallots/ Eschalots) Plant in garden. Harvest from May. Spinach/ English spinach) Plant in garden. Harvest from March. Spring onions/ Scallions/ Bunching onions/ Welsh onion) Plant in garden. Harvest from April. Turnip Plant in garden. Harvest from April. Wow, you guys can plant a lot! I sure hope to see lots of photos. They help keep us snow bound folk sane and dreaming. I hope to oblige, if the plants cooperate! Quite a difference from Zones 9a-9b. I guess my only point is, a Region has many zones, and each year, each month in each zone can be a little different from prior years. Therefore, use planting guides as guides, not concrete facts. The same 8a-9b Zones can be found in different latitudes with different amounts of sunshine, which will also affect outdoor gardening. Interesting what you share about the sunshine - when we were at 3500 feet our temps weren't actually that much colder (though they got down into the teens a few times) but we were in an oak forest so I didn't even bother planting a veggie garden. I didn't have enough sun to let it thrive, that and the deer were rampant that much higher up than the 1600 feet we are at now. Slight adjustments for Zones 8A, 8B, or 9B. Thanks for keeping the "what to plant" thread going! I haven't been here in waayyy too long!! @countrynaturals wrote: We have 3 more days of sunny skies and nights above freezing, then nighttime temps dip to 30 and 9 days out it could SNOW! I still have peppers, tomatoes, and zucchini in the garden. If they aren't ready in 3 days, I'll just have to pick them anyway, I guess. The greenhouse is doing okay. Nothing is actually thriving, but everything is staying alive and looking pretty good. In the house, all is well. I may not get any cukes this winter, however. My seedlings are all leggy. They want more light than I can provide indoors. While "touring the estate" I found 4 more zukes and another caterpillar (on the outdoor passion vine). They're all very small, but maybe they'll still make it. One zuke is already the size of a cucumber, so that one is almost in the bank. I tried to find something Christmasy for my December avatar and thought azaleas would be perfect. Doncha know they're all in bloom except the red ones. (Mother Nature has a strange sense of humor.) I'll change it again when my poinsettias get delivered. I always get the dollar ones at Lowe's and decorate with them. I like to think of December as the month we get to take off from the garden. The cold plants (brassicas, Swiss Chard, carrots, beets, snow peas, onions and garlic) are already well on their way and it's too soon to start spring and summer seeds indoors. Use this month to make sure the beds are clean, topped off with compost (if you had any left) and protected from flying leaves and weed seeds. Have Agribon or Plastic sheeting ready for freeze protection for the next 2 months. Sort seeds, droll over Seed catalogs, and pencil in your plot plan of the beds. 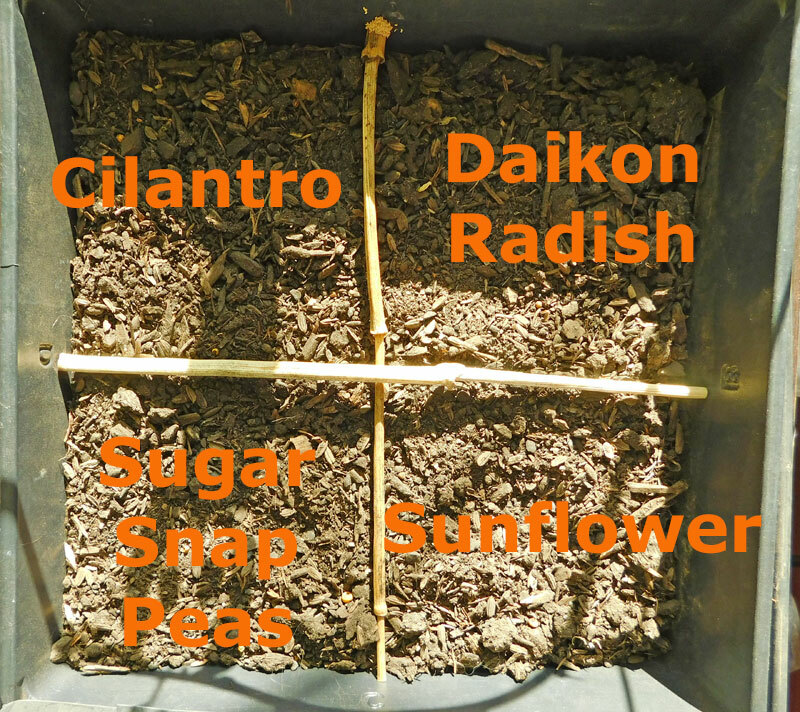 If you are adventurous, make a new compost pile with the new fallen leaves, farm manure, veggie trimmings and discards, Starbucks, old straw mulch. Cover between turnings with a tarp and it can easily get up to 160*F.
Nothing to do until February when you start the indoor seeds and sweet potato slips. Oh well, life is NEVER boring anyway, lol! @sanderson wrote: Nothing to do until February when you start the indoor seeds and sweet potato slips. Easy for you to say, Girlfriend. I'm busier than I was last summer (when it was too hot to do anything but water twice a day). Today I'm planting Brussels Sprouts and radishes, turning wood stove ashes into the compost heap, transplanting passion vine starts for the fritillary caterpillars, picking mixed greens for dinner, and working on my new spreadsheet (thank you, Marie ). I thought I was right on schedule for the holidays. Then daughter asked for hand-knit boot toppers, which sent me on a mission to make 4 sets of them for Christmas presents. I also still have several rock-painting projects to finish before Christmas, but as you said -- never boring. @sanderson wrote: I like to think of December as the month we get to take off from the garden. The cold plants (brassicas, Swiss Chard, carrots, beets, snow peas, onions and garlic) are already well on their way and it's too soon to start spring and summer seeds indoors. This time last year I had a counter top full of winter harvest. This year I was a month late getting the starts planted and the only thing I can really harvest are a few toy bok choy leaves and any twin starts that I can see. Each year is a little different. The leaves are just starting to fall, depending on the variety, so I can't even collect the neighbors' leaves. This means, gasp, that I can continue deep cleaning the house and take everything out of the side-by-side freezer and organize it. There are some seal-a-meals from last winter that should be eaten now before I start freezing this winter's crops. I canned sweet potatoes all day Wednesday, only to find out they taste terrible! Back to roasting and freezing them. If properly cured and stored, the sweet potatoes should last a long time without freezing or canning. my harvest from last year was still good enough to eat in June of this year when I used the remainder to make baby food for the new grandson. After ham and sweet potatoes for Christmas, I will see where I am with the leftover SP. Right now, the only place to store them is loosely in bags on the tile floor, which is 60*F at the surface. YIKES! Baker Creek says to start Brussels Sprouts seeds inside "several weeks" before last frost date. That could be right now if it's a mild winter. I just placed my order, so it looks like I'll be planting a few next week, just in case. "Start onion seeds indoors three months before the last frost date of spring." I'm already late on this one. @Me wrote: I tried to find something Christmasy for my December avatar and thought azaleas would be perfect. Doncha know they're all in bloom except the red ones. (Mother Nature has a strange sense of humor.) I'll change it again when my poinsettias get delivered. I always get the dollar ones at Lowe's and decorate with them. Here's what I'm planting today for transplanting outside later on. and for microgreens in the house. Just planted Atomic Red carrots in about 4" of leaves on top of aged compost/potting soil outside the Salad Bar. Fingers crossed the rolly pollies don't get them.